There is a pernicious force that operates in all societies, but especially in ours and especially in these sad days. It is a force that destroys economies, obliterates cultures, increases want, and undermines communities. And this destructive force has a name. Let me explain precisely what I mean. And I think the best way to do that is by providing some examples, and out of the hundreds I could supply, I will point to two. One involves Haitian rice farmers and the other African cobblers. Of that first, we can note that in the 1990s, Haiti was going through one of those perennial crises which beset the tragic history of that small nation. Now the Clinton administration, working from the best of motives, that is, charitable motives, decided that the best way to help would be to provide highly subsidized American rice to the Haitians, thereby lowering the cost of a food that was a Haitian dietary staple. And as an added bonus, it would also be a boon to the rice farmers of Bill Clinton’s home state of Arkansas. From the standpoint of the Clinton administration, this was surely a ‘win-win’ policy. There was one slight problem with this plan, however. Rice was a staple in Haiti because the Haitians already grew the rice that they ate. But the influx of cheap American rice destroyed the Haitian farmer, who simply could not compete with the highly subsidized produce of a rich and technologically advanced nation. The farmers lost their land and livelihoods, and became dependent on cheap American imported food. And the plan changed the dietary habits of the Haitians. Rice was a staple, yes, but something they had three or four times a week. But with the increase in poverty, it was the cheapest food, and now they have it three times a day. If they can get three meals. “Ah,” but you say, “That’s the government and they always mess things up. Private industry and private charity always does better.” That brings us to the case of Toms Shoes. I’m sure you know their brilliant marketing plan: “Buy one-give one.” For every pair of shoes you buy, they donate a pair to people in some impoverished (in their view) country, most often in Africa. This allowed Toms customers to feel they were engaging in responsible consumption and to signal their virtue in their footwear. The problem is that Africans already knew how to make shoes, and they didn’t need any help from Toms; Africa had its own thriving industry. But nobody can compete with free, and as in Haiti, honest workers lost their livelihoods, to join the mass of the poor and dependent. 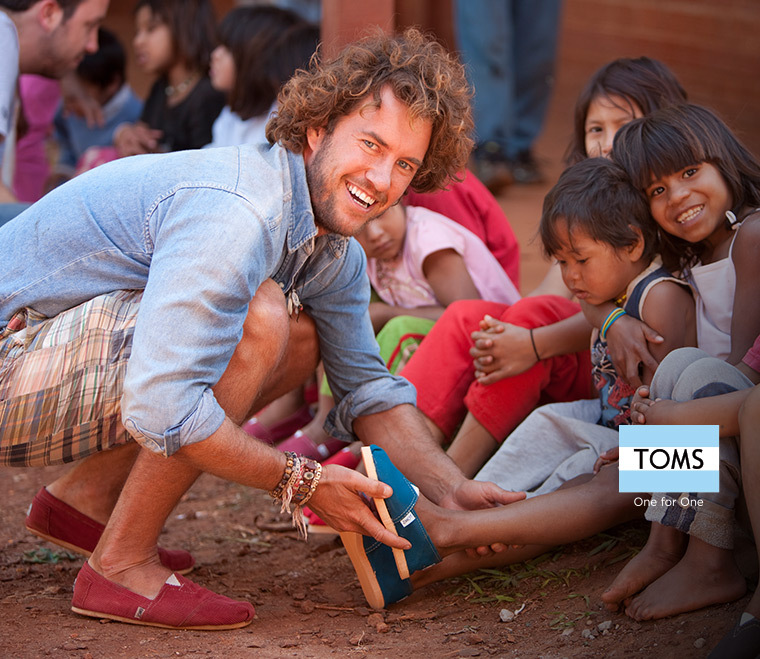 Toms allows well-meaning people to act as responsible consumers so that consumption can serve wider goals. In itself, there is nothing wrong with that; indeed, it is both necessary and salutary. Certainly, there are good reasons to buy, say, fair trade coffee, or to purchase goods made by local artisans or grown by local farmers. And there can be no doubts that we have some responsibility, as consumers, to the people whose labor contributes to our well-being. Our wealth and enjoyment cannot be rooted in their exploitation and misery. And at the level of government, a rich nation and highly developed nation such as ours certainly has obligations to less-developed areas. So, what went wrong in these examples? In the Gospel of St. John, we read that Deus caritas est, God is love, that is, “charity.” So our charity should be the expression of the love of God, God as it were acting in and through us in the world; charity should be our best selves. But there is another Latin motto: Corruptio optima pessisma, “The corruption of the best is the worst.” So what is it that corrupts the best, charity, into the worst? In both cases, charity and justice have become separated; charity was one thing and justice quite another. What unites these two examples is that is that in both cases, charity and justice have become separated; charity was one thing and justice quite another. And this division leads to those pernicious effects I just mentioned, and to many more I could mention. For while there are many causes for an individual case of poverty, when poverty is widespread, the cause is always systemic, that is to say, always rooted in structures which are unjust. And when problems of injustice are referred primarily to charity, than charity itself becomes at first the prop and support of unjust institutions and structures, and ends up by becoming itself a cause of injustice. This never-ending search for “rights” leads to the caricature of the “social justice warrior,” a figure so much in evidence that it is known simply by its initials, the “SJW.” Unfortunately, this caricature has led the Right to reject the whole notion of social justice and to refer all social problems to charity, thereby widening the split between justice and charity and deepening the problems. Structural problems are ignored or even made worse, aided by a rhetoric of “getting the government off our backs.” So we end up with a toxic dichotomy: social justice is filled with a false content from the Left, and emptied of all content by the Right. How are we to escape this conundrum? I think three things are necessary. One, we must look at social justice in its historical development, and especially in its development in modern Catholic social teaching. Two, we must give it some concrete description. Three, we must give some practical examples. The notion of social justice is clearly spelled out in the early fathers of the Church, particularly in the works of St. Clement of Alexandria, St. Basil the Great, St. Ambrose of Milan, St. Augustine, and my patron, St. John Chrysostom. But in the interests of time, I will jump over these saints, and many others in the Medieval period, and go directly to the modern era, which is the period of most interest to us. “Social justice” as a term first enters Catholic theology in 1840, in the writings of the great Jesuit scholar, Fr. Luigi Taparelli d’Azeglio. Fr. Taparelli was working in the aftermath of the French revolution when its revolutionary principles were being extended into Italy during the period of Italian unification. This extreme form of liberalism was rooted in an individualism which stripped man his natural associations such as family, community, religion, region, etc. Taparelli used social justice to pose an alternative to these individualistic doctrines and the laissez-faire politics and economics that accompanied them by stressing man’s social nature. Taparelli’s ideas passed to his student, a man with the imposing name of Vincenzo Gioacchino Raffaele Luigi Pecci, better known to history as Pope Leo XIII. Many of the ideas of social justice find their way into the great social encyclical Rerum Novarum, but not all of them and not under that name. The term “social justice” will not be incorporated into Catholic Teaching until 1931, in Pope Pius XII’s great reinterpretation of Leo’s work, Quadragesimo Anno. In that encyclical, the term “social justice” is used nine times, and it usually appears in connection to two other terms, “social charity” and “the common good.” From Pius’s work, social justice is incorporated into every subsequent social encyclical, into the Compendium of Social Teaching, and into the Catechism of the Catholic Church. As such, it is part of the Ordinary Magisterium of the Catholic Church, formally binding on the consciences of all faithful Catholics. At this point, we must give a description of “social justice,” so that we have something intelligible to work with. Justice, of course, is always a matter of giving to the other that which is due to him. So in that sense, justice is always social, always a relationship between individuals or between individuals and a group. So how do we distinguish social justice from other forms? Justice is normally divided into three kinds. There is distributive justice, commutative justice, and legal justice. Distributive justice deals with distributions from a group to its members. When the “group” is a business firm, this deals with payments to those who contribute to production, e.g. wages, payments for raw materials, and the distribution of profits. The standard of justice here is contribution: members of the group should receive in proportion to what they have given, but no more and certainly no less. Commutative justice deals with exchanges between individuals, be they monetary exchanges or otherwise. The standard of justice here is equality in exchange; each person should both give and receive in equal amounts so that no one is taking advantage of the other. For every dollar given, you should receive a dollar’s worth of value. The third kind of justice is legal justice, which deals with what individuals owe to the group. Legal justice asks, “What does each citizen owe to the state and the community, or each employee owe to the company, or each member of a community owe to the group?” The standard of justice here is good order. So there is a three-fold structure to justice: distributions from a group to its members, which is regulated by contribution; exchanges between the members, which is regulated by equality in exchange; and duties from the members to the group, which is regulated by good order. With these three types in mind, where does social justice fit in? In this way: Social justice applies the three types of justice to the institutions of business, government, and society, and harmonizes them in order to ensure the common good. And here we ask what things are necessary for the common good? What does the family need for support, business need to function and thrive, the community need to develop? Social justice deals in terms of the systemic and structural aspects of business, government, and society. So, for example, we know that people need useful work to develop and support their families, and wages capable of supporting a family. Families need access to education to develop their children, and access to health care to provide some security and stability. Social justice addresses all of these questions and many others at the level of social institutions and social structures and tries to arrive at a common good, that is a good that serves the needs of all, without putting an undue burden on one group or creating an undue advantage for another. Our politics are caught in a dialectic between markets and socialism, a dialectic that is toxic because it has no real resolution. Now, since it applies to the overall structures society, it should be obvious that social justice is a political question, and I include within political order the subject of economics. So the obvious question is how do we apply it to the realm of politics? And here we come to a real problem, because our politics are caught in a dialectic between markets and socialism, a dialectic that is toxic because it has no real resolution. All of our political and economic discourse, or nearly all of it, treats these terms as opposites, even though this does not, and cannot, correspond with any reality we actually see, either today or at any time in human history. For the plain fact of the matter—that is, the fact we see always and everywhere—is that all markets depend on a pre-existing order that no market can create but that it can, through inattention, destroy. For it doesn’t matter how good you are at making products; if there are no roads to take them to market, you will not be successful. If each entrepreneur had to dig his own latrine, drill his own well, provide his own security, educate his own customers and workers, or substitute for any of the hundred other services that have been socialized, he would have precious little time to devote to his business. The presence of socialized services does not crush the market but enables it. The less the entrepreneurs have to think about these things, the more they can think about providing useful goods and services to their neighbors and trying their hands and their wits in the hurly-burly of the market. Some may object to labelling as “socialism” all expenditures on socialized services. But to argue this is to argue about a term and not about a fact. Call it what you will, the mutual dependence of the market on socialized services can neither be rationally denied nor historically confounded. In truth, there is no pure free market, nor any pure socialism. Socialism, if it is to work at all, can only be funded within a market economy; likewise, a market economy requires socialized services, or it cannot be at all. And capitalism is entirely a creature of the state; on one level there is no point in complaining about “crony capitalism,” since that is the only capitalism that has ever existed, or ever will exist. The great danger comes when one faction tries to displace the other to create a “pure” form; but any attempt to abolish one term in favor of the other can only destroy both. Pure socialism and pure capitalism can only be pure failures. With this mutual dependence in mind, we can re-orient our political discussions towards the common good. And the question here becomes, “What services are properly socialized, and what products are properly left to the market and individual initiative?” The answers will vary from society to society; they are not given in advance. But reframing the question leads to new and (I believe) better and more productive ways of talking about our common problems. So how do we answer the question in terms of the proper division between socialized and market goods? In one case, goods are allocated to the public from a common fund, and in the other they are allocated to individuals by their level of income. Now, once a certain material sufficiency is met, that is to say, once people have a certain sufficiency of basic goods such as food, clothing, shelter, and transportation, there is absolutely no question of justice in allocating goods by income alone. That fact that some eat better foods, live in larger homes, drive newer cars, and so forth involves no question of justice, social or otherwise. A strict equality is neither necessary nor desirable. In fact, the opposite is true. If income differentials are related to real contributions to production, then it is just that those who contribute more receive more. But, can the same thing be said for goods like education or health care? Should these be purely market goods, or should they be allocated, in whole or part from a common fund? Should only the children of the upper classes have access to a good education; should only the man with funds receive medicines? Here, the question of allocating goods by income alone becomes morally suspicious and socially disruptive. Nor can this question be referred to charity alone, as if the children of the poor had no right to learn their ABCs, but did so only by the sufferance of the rich. In fact, when it is necessary to provide such things by charity, it indicates a failure of social justice, it means the structures of society are out of balance and not oriented to the common good. So when we engage in charity, we must always operate at two levels: the level of immediate need, in which the most pressing requirements of the poor can be met by individual and immediate acts of charity. But this must be done in concert with the need for structural reform. What cannot be done is to refer all problems of poverty or health care or education, etc., to charity; when that is done, structural reform is short-circuited, and charity becomes the excuse and support for injustice. Rather, acts of charity and the works of reform must be joined so that social charity and social justice become one thing rather than two, both aiming at the common good. Of course, all of these are difficult questions and the common good can be difficult to locate. But Catholic Social teaching does provide us with one solid standard that can always be applied. It is called, “The Preferential Option for the Poor.” That is to say, each and every policy needs to be evaluated from the standpoint of how it affects “these, the least of my brothers,” so that the needs of the poor and marginalized are considered in every action. What could be more absurd than to say, “we must oppress our workers so that the shoes will be cheap enough to give away”? So, for example, in the case of Haiti and of Toms Shoes, the effects of these actions on the farmers and cobblers should have taken into account. This could have been done by including them in the planning, so that a common good could have been found. And in the case of Toms Shoes at least, the pseudo-charity covered up the lack of justice. The primary obligation of the company in justice was to deal fairly with workers, suppliers, and the community. But Toms Shoes are made in the same sweatshops as are many other shoes. So before they started giving shoes away, they should have first given a fair wage to their employees, so they could buy their own shoes; they should give a fair price to their suppliers, so they could develop their businesses; they should give what’s due to the communities they serve so they could develop the common good. But in actual fact, the “charity” of giving shoes away is used to cover up the injustice in how the shoes are made. But what could be more absurd than to say, “we must oppress our workers so that the shoes will be cheap enough to give away”? But in truth, I am less concerned with the problems of poverty in Haiti or Nigeria than I am with those problems in Portland and Dallas; these are closer to me, and hence I am more responsible for them. Now, I don’t know much about Portland, but let me give you an example from Dallas, something that happened 10 or 15 years ago. There was a lady in the poorer part of town who made her living braiding hair, a business she ran from her living room. Her work was successful, and she provided a service that made women feel better about their appearance, and in this way she contributed to her community. And then the world of social structures fell in upon her. In the first place, she had no cosmetology license, and who knows what evils would arise from hair-braiding without the requisite 3,000 hours of education necessary for the license; I’m sure that no mother allows her daughter to braid her own hair without this license. The health department required that she have a sink in the same room in which plied her trade, for who knows but that the bubonic plague would spread if she had to walk all the way to the kitchen to wash her hands. And of course, she was running a retail business in a residential area, converting her capital, that is, her home, into income through work. And we know that can’t be allowed. And I suspect she was violating a 100 other laws and regulation, and so offending the bureaucratic dignity of the City, State, and Federal governments. And so she was driven out of business. Now, I have no idea what happened to her. But if she is now poorer and getting help from food stamps and other forms of welfare, is that her fault, or ours? I offer this as a small example of the way structures, and structures that are likely appropriate in some situations, work to keep the poor down. Here was a lady who exercised her initiative to use her own skills and her own capital to make her way in the world as an independent businesswoman. This use of your own labor and capital to make a small living is the idea behind enterprises like Uber, Lyft, or Airbnb. And whatever the faults of these particular organizations might be, more ways should be found for people to do this. Do not get me wrong; I am not a laissez-faire kind of guy. I am perfectly aware that rules and regulations are necessary for any kind of order or social cooperation. But such rules must be appropriate to the situation, and not every neighborhood needs the same kind of rules. I am sure that most of us live in neighborhoods where people would object, and justly so, if someone were running a business repairing cars on his driveway or back yard. But in other neighborhoods, this might be quite appropriate, especially in neighborhoods with widespread unemployment or underemployment, where cars tend to be older and more in need of maintenance. The point is, let the neighborhood itself decide what is appropriate in their area. And this accords with that other great principle of Catholic Social Teaching, subsidiarity, the idea that control should be exercised at the lowest possible level. This is not a principle against regulation; anybody who has ever dealt with a homeowners association knows that regulations can multiply at the bottom just as easily as at the top. But it is a principle of local control, wherever that is possible and practical, and of allowing people to have as much control over their lives and communities as is possible, consistent with the common good. And here, I think we are talking about an opportunity for the perfect application of this principle. Take the problem of food deserts. I don’t know how much of a problem this is in Portland, but in Dallas, there are large neighborhoods without supermarkets, and people must take the bus to do their shopping, or go to “kwik-i-mart” type places, and pay a high premium for lower quality food. Now, there are many schemes to address this problem, things like food cooperatives, financing schemes for neighborhood markets, mobile markets moving from neighborhood to neighborhood, local farmers markets, etc., all of which meet with varying degrees of success. However, we may be complicating this problem in unnecessary ways. This would seem to be an easy problem to solve, if you can get past regulatory barriers. If people could sell canned foods from a spare room or garage, many food centers could be established, so that there were many choices in the neighborhood. And this would be a perfect opportunity for a social charity to actually do something charitable, something that increased independence rather than dependence. For example, they could establish food warehouses to buy at wholesale and distribute produce to the small retailers for a small fee. They could help with marketing, training, billing, and all the other services that even a small business requires. This would be a true social charity, because it would be linked to social justice and aim at the common good. And it would be in cooperation with the neighborhood, not some external force imposing rules and teaching dependence. These small garage stores could have another effect: people who grow food in their yards would now have a market for their produce, thereby increasing the food diversity in the neighborhood and allowing people another source of both income and of satisfaction and pride. For in truth, we all derive some satisfaction and pride by providing things for our neighbors. And who knows that these would not become centers for other services. Who knows? Some woman might even use them as a place to establish a hair braiding business. Local responsibility prevents charity from being something imposed from the outside and so experienced as “foreign” and alien. The key point is to empower neighborhoods as much as possible, in as many areas as possible, areas such as schooling, policing, commerce, etc. I do not pretend that this is always easy or is a panacea, or that local leaders will not run into the same kinds of questions and difficulties as do leaders at city and state levels. But I do believe it will allow people and neighborhoods to discover, by trial and error, the best solutions for their particular situations, and it will force them to take responsibility for both their failures and successes. And it is this local responsibility which prevents charity from being something imposed from the outside and so experienced as “foreign” and alien. There is no magic bullet or fixed program that will make the pursuit of justice automatic and lead to a stable utopia allowing us to turn our attention to other matters. Justice will always require constant care and attention, and the impetus for such care can only come from the well-springs of charity, of brotherly love, of a social and religious concern for the common good. Let me summarize by saying that charity and justice cannot be separated. Charity is the transcendent dimension of social order, Justice the political and economic dimension, and the common good the unitive term that combines the transcendent and political into a guide for action. And the common good cannot simply be imposed, something that those at the top, with money and power, impose on the bottom, but must rise from the bottom to the top, and incorporate all levels under the guidance of solidarity. I close with a reflection on a statement from Dorothy Day, the founder of the Catholic Workers Movement. She said, “When I fed the poor, they called me a saint; but when I asked ‘why are they poor?’ they called me a communist.” That summarizes the terrible dialectic we must always break. We must feed the poor and meet their needs where we find them. But this can never be a substitute for justice, or a negation of the need to expose and correct the structural causes of poverty. They must always be found together, because separated, they can only result in worse evils. She did not say this. Dom Helder Camara did. Wow, man. This is a really great article. At this moment, I’m not sure I find anything wrong with what you’re saying here. I could anklebite a few minor things (education), but it’s not necessary. Heck, I ought to invite you to my blighted part of town to see what ideas you’d come up with. I’ve wondered quite often what I’d do to improve the area. My mind could change, as I am not all-knowing. But today, I agree. Thank you for the order and clarity you brought to these questions. In re subsidiarity, lower income neighborhoods, and creative use of one’s capital and labor — not to mention ‘feeding the poor’, or feeding anyone — not only urban gardening, for which there is plenty of room in many if not most towns and cities, but urban livestock, banned in most places, could leverage garbage into eggs and chicken dinners, and weed-infested lots into goat’s milk. When our family lived in Irving we kept a large garden and chickens down by the Trinity on University of Dallas property . The chickens, fed scraps and garden trash, provided us with a supply of fresh eggs until some creative person with a crowbar wrenched the hasp off the door and began helping himself to two birds at a time until they were all gone. Our chagrin was tempered by an artistic appreciation of the unknown gourmet’s survival skills. I live in Irving. And teach at UD. Not a cover up, but a choice of marketing strategy to generate sales. Giving away a pair for each pair purchased is far more effective, (because it’s tangible to the consumer), at generating sales than is paying a living wage to factory workers. Tom’s shoes was nothing more than very good marketing from the very first story.